On this day in 1863, an excavation on the Greek island of Samothrace, led by an amateur archaeologist named Charles Champoiseau, unearthed a large winged female statue carved from white Parian marble. Known today as the Nike of Samothrace, the sculpture is considered one of the greatest masterpieces of antiquity, and replicas appear everywhere from its original location on Samothrace to Caesar’s Palace in Las Vegas. The original is dramatically displayed above the Daru staircase in the Louvre, in Paris. The Greek island of Samothrace is located in the northeastern Aegean Sea. In ancient times, the island was home to a temple complex known as the Sanctuary of the Great Gods. The sculpture, also commonly known as the Winged Victory of Samothrace, was found in fragments by Champoiseau’s team amongst blocks of grey marble and a small building overlooking the sanctuary. They searched in vain amongst the rubble for statue’s arms and head, which to this day have never been recovered. Soon after its discovery, Champoiseau arranged for the sculpture to be sent to Paris. Dated at about 190 BC, experts were unable to identify the sculptor, but they did conclude that the sculpture had been erected to commemorate a naval victory by a Macedonian general. This conclusion was further solidified by the discovery in 1875 that the blocks of marble amongst which the statue was discovered were likely the base, and together they formed the prow of a ship on top of which the goddess stood. The blocks were sent to Paris and eventually the statue and its base were joined and viewed together as they are today, floating above the Daru staircase in the Louvre. Nearly a century later, in 1950, a team of archaeologists led by Karl Lehman discovered the missing right hand and a ring finger nearby the sculpture’s original position on Samothrace. Another finger and a thumb were then discovered by Lehman’s wife Phyllis Williams Lehman in Vienna amongst the fragments collected from another excavation in the late 19th century. Together these pieces were sent to Louvre where they are now on display. The statue is celebrated for its dramatic and masterful display of movement and form. Many consider its lack of head and arms to add to its beauty. It certainly adds to its iconic appearance and its visual impact as it forces the viewer to use his or her imagination to complete the artwork. The Nike of Samothrace is one the Louvre’s most beloved treasures today. A plaster replica has stood in a museum on Samothrace’s Sanctuary of the Gods since the late 19th century. 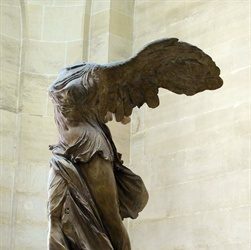 Caption: “Nike of Samothrace” displayed in the Louvre Museum in Paris.